New general manager Elton Brand is starting his Philadelphia 76ers tenure with a major gamble. This weekend's blockbuster Jimmy Butler deal officially puts the Sixers in win-now mode, but there are no guarantees this trade actually makes the team better -- let alone sets the franchise up to make a Finals run. The Sixers are 8-6, just 2½ games back of second place in the East. But their key statistical indicators show they've played more like a lottery team than a contender. Philly ranks 19th in net rating and 21st in offensive efficiency. Yikes. For this trade to hit, both of those metrics must improve. As a four-time All-Defense selection, there's little doubt Butler will elevate the team on that end. However, the Sixers' major issues are on offense, and it's hard to find numbers that suggest this trade will fix them. Last year's Sixers ranked 14th in offensive efficiency. They're worse this year, and it's not clear how Butler solves that, especially considering any gains he brings must offset the losses of Dario Saric and Robert Covington. Saric and Covington aren't stars like Butler, but they fit nicely next to Ben Simmons and Joel Embiid. Today's best NBA offenses pair creators with stretchy, off-ball sharpshooters. Simmons is the kind of youthful on-ball maestro most teams crave, yet Philly just sent Minnesota a big chunk of its spacing for another ball-hungry dribbling machine. It's akin to a car trading its two rear tires for a second steering wheel. These two "Process" babies not only provided space for Embiid and Simmons to work, they've also combined to launch over 11 3s per game this year and represented 34.1 percent of Philly's total 3-point volume. Both players take over half of their shots from beyond the arc. During the Sixers' 16-game win streak to close last season, the team posted the NBA's third-best offense with a 55.6 eFG% and 33.3 3-point attempts per game. Saric and Covington combined for more than a third of those attempts, converting 38.1 percent. Without them, Philly's spacing will suffer. It's going to be nearly impossible to develop a catch-and-shoot machine that elevates this struggling group without more moves. Of course, Brand and company are probably not done tinkering in the garage. Recall that Philly acquired two big perimeter pieces in midseason deals a year ago by snagging Marco Belinelli and Ersan Ilyasova. It's reasonable to expect them to grab at least one this year. They'll need to, because as presently constructed, this team doesn't have enough firepower to compete with the rising contenders in the East. 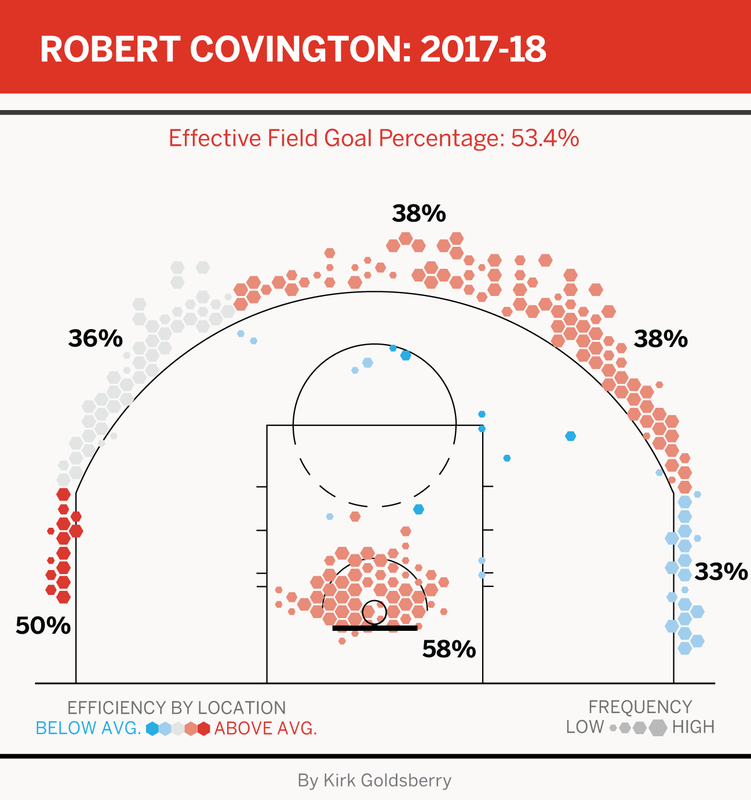 Butler can replace some of Covington and Saric's activity, but not all of it. He's a 2-point man who dabbles in long-range shooting. Yes, he is averaging a career-high 4.5 3-point attempts per game, but only 29 percent of his looks comes beyond the arc. 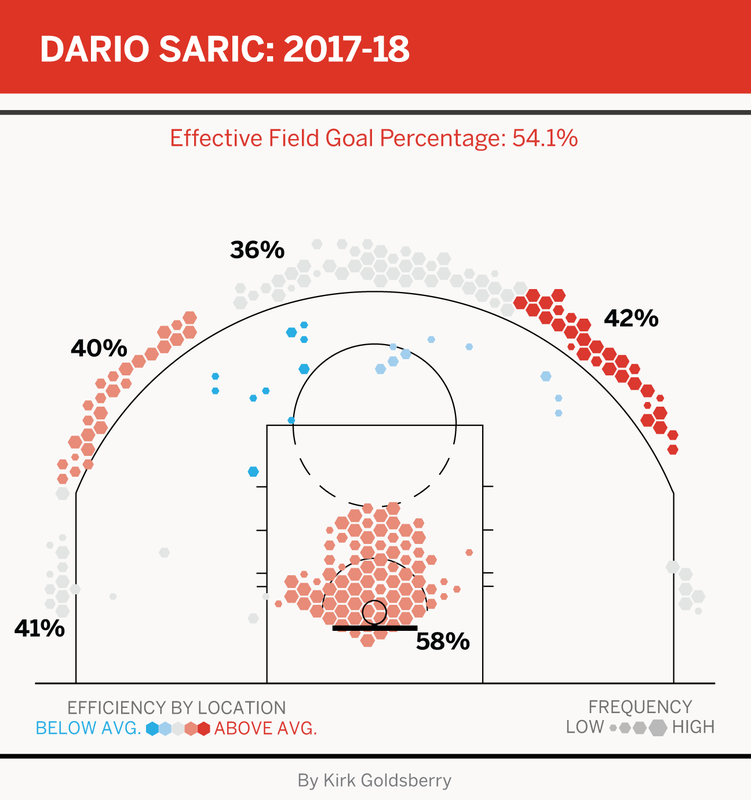 He's going to introduce a lot more midrange into Philly's shot selection. Where do Simmons and Embiid fit in around all this? Per Second Spectrum tracking, 55 players have logged at least 100 drives this season. Butler ranks 50th in points per drive (0.89) among that group. That 0.89 figure is by far his lowest such mark in the past five seasons (and down from 1.12 in 2017-18). Butler is logging the lowest free throw rate of his career, averaging just 0.39 free throws per field goal attempt. Philly fans are hoping those numbers are a reflection of the chaos Butler just left behind, as opposed to the byproduct of declining athleticism. Regardless, Butler could drop off sooner than expected, considering the plights of his old Chicago Bulls teammates Luol Deng, Joakim Noah and Derrick Rose. Like those guys, Butler played loads of minutes for Tom Thibodeau. He has averaged over 35 minutes per game in each of the past six seasons and led the NBA in minutes played in 2014-15. The Sixers' weakened depth after this trade means they'll need Butler to continue the serious playing time. Deng, Noah and Rose each had major orthopedic issues by age 30, but teams still talked themselves into overpaying them. And that's where this deal gets really scary. Philly is ready for a long-term investment in Butler, according to reporting by ESPN's Adrian Wojnarowski and Zach Lowe. That would mean a potential five-year, $190 million deal this summer. If the Sixers and Butler agree to the max, that contract will begin just after Butler turns 30 in September 2019 and extend to 2024. Will it be worth it? Time will tell, but keep an eye on these indicators. 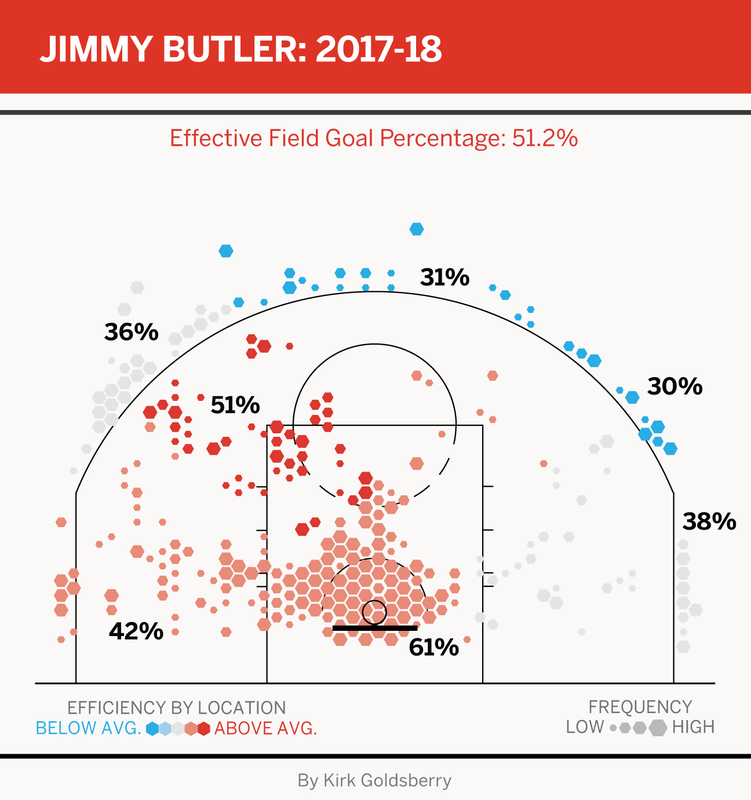 Can Butler propel this team to improve its net rating and offensive efficiency, or has his ability to drive already passed him by?